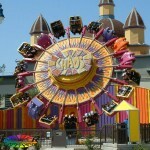 Chance’s first Chaos was first produced in 1996, with just over 50 rides being built till production ceased in 2007. 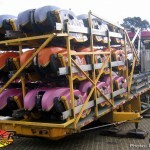 Like Chance’s Turbo and Zipper, the ride movements involve the random balance of its cars on an axis. 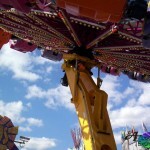 The ride consists of what Chance describes as “a three-dimensional rocking, rolling and rotating motion” as two-person bucket seats flip around freely, while attached to a main wheel with an electric, variable speed drive (holding 18 twin-seats), that varies in angle hydraulically. The ride is very well presented with a good colour and light scheme. Unlike the Zipper, the seats are totally restrictive on body movement with an ‘over-the-shoulder’ restrain system. Upholding Chance’s reputation for easy portability, the complete ride racks up on a single trailer. 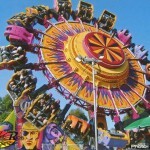 Kindly send your e-mail address so I can contact you regarding the rides I am interested in. 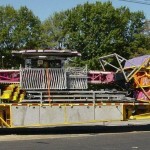 I currently own two of these rides, hopefully will have them finished and refurbished one day in the future. It is a beautiful ride and a great thrill when running. I’m sorry for the bad english. i’m indonesian. What’s the name of the font for the ride’s logo?